I am a sucker for easy dinners, especially with a toddler in tow. He loves my attention, and cooking yummy food is no excuse for a break! Baked chicken and veggies that require very little work are my top picks, that way I can easily stop what I’m doing to attend to my son. And the finished product usually tastes great. I used this recipe for the challah rolls. My starter was mostly all-purpose flour at the time, but I did use bread flour as called for in the recipe. I set it up overnight so it soaked for about 12 or 13 hours. The more broken down the flour is, the better for my family. 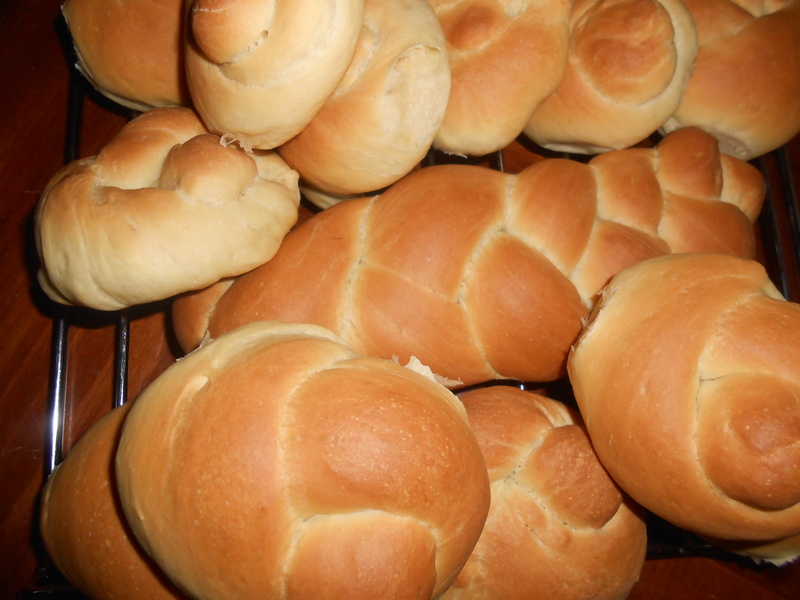 In the morning, I kneaded it again to get all the bubbles out and shaped the rolls. I do not have a rolling pin (where did that pesky thing go???) so I just did a handmade “snake” as my son likes to call it then shaped them. Left them for maybe 3–possibly 4–hours (until they were nice and puffy) and then baked them. I think they baked up pretty nicely, should have went ahead and done an egg wash! Mix up some stuff in a big oven-safe glass container–coconut aminos, raw honey, finely chopped onions, fresh pressed garlic, powdered ginger, crushed red pepper flakes, salt, olive and coconut oils. As you can see, I made some variations. I rarely ever follow a recipe to a T. Mix well! Preheat oven to 400*. This chicken would’ve been better off soaking in the mixture for several hours. Anyway, put the chicken in there and coat well. Keep doing so until your oven is preheated. Set timer for about 40 mins (I did mostly drumsticks, breasts take less time). Remember to turn pieces every now and then! In the meantime, get your beans ready (and other sides if you’re making any). We had farm fresh beans so I had to cut the edges off and attempt to remove some strings. Most of the strings were still on the beans. Oh well. Bring to boil, cover and turn down heat. Cook until soft but still firm, they shouldn’t bend too easily and definitely shouldn’t be mushy! Drain and set aside. Get a big skillet and put a tbsp of olive oil and a tbsp of coconut oil in there. Cut up 3 bell peppers, 1/2 an onion, and crush 3-4 cloves of garlic. Turn on medium low, stir in the onions with oil until translucent. Stir in the garlic until it smells good. Put in the bell peppers and cook for about 2 minutes, then add the green beans. Mix well, salt to taste, then turn off and cover to retain heat. The chicken should be just about done. I also broiled for about 2 mins on each side, my family has an aversion to chicken that isn’t browned enough. Turn off oven and leave inside until ready to serve. Remember I did mostly drumsticks, and the folks I made chicken breasts for like their chicken on the drier side. Might want to take out any cuts that cook more quickly if you like your chicken juicy. Yum!!! We enjoyed this with some tart cherry water kefir. ← More Probiotics, Not Less! Have you ever considered about iluicdnng slightly bit more than just your articles? I mean, what you say is critical and all. However feel of in case you added some great visuals or video clips to give your posts a lot more, e2€œpope2€9d! Your content is excellent but with images and videos, this web site could undeniably be one of the quite finest in its niche. Wonderful weblog!